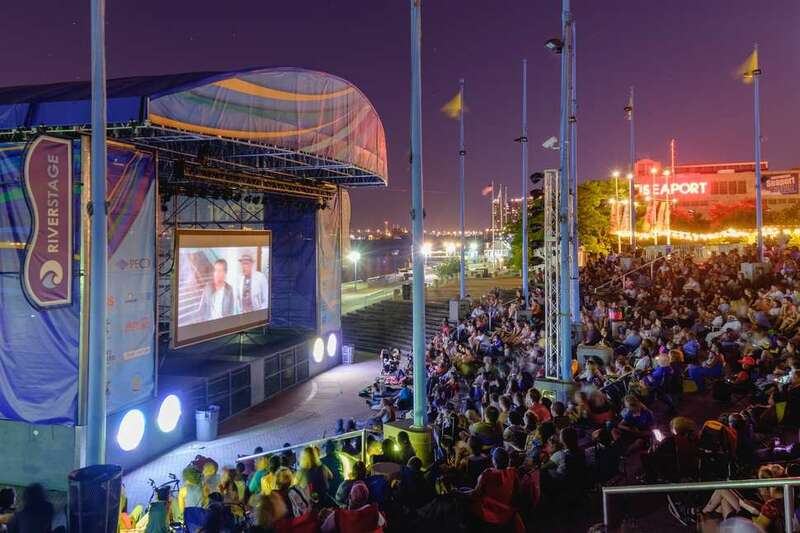 Summer in Philly brings out all the best stuff, including beer gardens, fireworks, street festivals, and perhaps most importantly, outdoor movie screenings. That said, with virtually every public space putting on its own summer movie series, how can you hope to keep track of them all? Fear not: we’ve put together a comprehensive calendar of all the outdoor screenings going down over the next few months (which you’ll wanna bookmark, along with our overall summer event calendar). Grab your blanket, bug spray, and snacks, and get ready to set up the ultimate cinematic picnic. Head to NoLibs for an al fresco movie night in the courtyard formerly known as the Piazza on Thursdays. 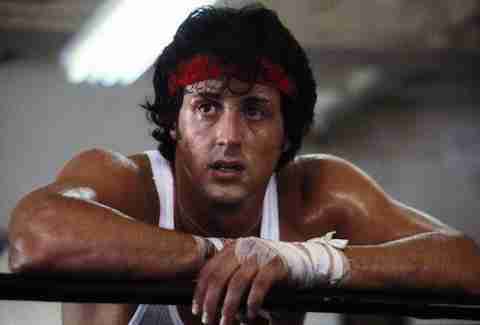 What would a summer movie night in Philly be without a Rocky screening? Grab food from any of the nearby eateries beforehand, but be sure to bring your own chair. A large screen pops up along the Walnut Street entrance to the Schuylkill Banks Thursdays in July and August for a viewer-curated outdoor movie season. See the cinematic classic Casablanca from the comfort of your own blanket. You’re encouraged to bring your own picnic, but some snacks and beverages will be available. As a city wedged between two rivers, it’s only fair that the Delaware River waterfront get some movie action, too. Thursdays in July and August, family-friendly movies like Jumanji: Welcome To The Jungle will be shown. Be sure to bring a blanket. As a part of Mt. Airy’s Moonlight Movies, the neighborhood’s parks and the Trolley Car Diner host outdoor movie screenings on alternating Friday and Saturday nights through the end of August. Curated with kid-friendly selections in mind, the summer’s cinematic theme spotlights international cultures; there’ll also be food trucks, ice cream, and more. A few times a season, this storied and picturesque cemetery hosts an outdoor screening on its grounds. Naturally, the teen witch drama The Craft is the perfect pick for such a setting. Be sure to bring your own chair, blanket, and snacks, though there will be food trucks and vendors. As a part of the city’s Parks and Rec summer movie series, green spaces around the city will become makeshift movie theaters for family-friendly flicks. A popular choice this summer, Black Panther, will be shown; come supplied with your own blanket or chair. Every Wednesday through August, FringeArts presents an outdoor movie in their beer garden under the Ben Franklin Bridge. Grab a bite and drinks at La Peg (inside) or The Shack (outside). 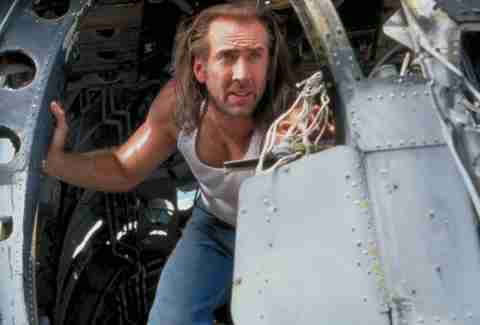 This week brings Nick Cage to the big screen, trapped on a plane with John Malkovich (and other criminals). Head to NoLibs for an al fresco movie night in the courtyard formerly known as the Piazza on Thursdays. Sing along to all the tunes from The Sound of Music, grab food from any of the nearby eateries beforehand, and be sure to bring your own chair. A large screen pops up along the Wharton Street entrance to the Schuylkill Banks Thursdays in July and August for a viewer-curated outdoor movie season. Pixar’s latest smash, Coco is the featured flick; you’re encouraged to bring your own picnic, but some snacks and beverages will be available. On Thursdays this summer, Manayunk welcomes food trucks, vendors, $6 dining deals, shopping, and more for their Stroll The Street series. On select days they’ll screen movies too, like Wonder Woman. As a city wedged between two rivers, it’s only fair that the Delaware River waterfront get some movie action, too. The third installment in Tom Cruise’s Mission Impossible series comes to the riverfront. Bring a blanket. Before these family-friendly screenings, get a tour of the historic garden, then cozy up in the garden courtyard for this once-monthly event. It feels appropriate to view The Jungle Book surrounded by wildlife, no? Part concert, part outdoor showing, The Philadelphia Orchestra play the score to Star Wars: A New Hope live as the movie is projected on three giant screens. The venue offers concessions, and does have ticketed seating in addition to lawn spots. Fridays in July and August, catch recently released films in the shadow of City Hall; grab a pitcher of your beverage of choice and snacks from the on-site cafe, and be sure to bring a chair or blanket. Continue the Star Wars love from last night with The Last Jedi. This original movie from NFL Films details the Eagles’ rise to Super Bowl champions, and it’ll be soundtracked live by the Philadelphia Orchestra. The venue offers concessions, and does have ticketed seating in addition to lawn spots. Every Wednesday through August, FringeArts presents an outdoor movie in their beer garden under the Ben Franklin Bridge. Grab a bite and drinks at La Peg (inside) or The Shack (outside). As a part of the city’s Parks and Rec summer movie series, green spaces around the city will become makeshift movie theaters for family-friendly flicks. Here’s another chance to see Coco (but don’t worry, it won’t be your last). Come supplied with your own blanket or chair. Head to NoLibs for an al fresco movie night in the courtyard formerly known as the Piazza on Thursdays. Grab food from any of the nearby eateries beforehand, and be sure to bring your own chair. The third flick in the Harry Potter franchise will be shown on a 40-foot screen, and the soundtrack will be performed live by the Philadelphia Orchestra, too. The venue offers concessions, and does have ticketed seating in addition to lawn spots. A large screen pops up along the Walnut Street entrance to the Schuylkill Banks Thursdays in July and August for a viewer-curated outdoor movie season. You’re encouraged to bring your own picnic, but some snacks and beverages will be available. Thursdays this summer, Manayunk welcomes food trucks, vendors, $6 dining deals, shopping and more for their Stroll The Street series -- and nothing says Christmas in July like the holiday classic, Elf. As a city wedged between two rivers, it’s only fair that the Delaware River waterfront get some movie action, too. Just a few days after another Star Wars film was shown (at the Mann), another one gets a screening on the other side of town. Bring a blanket. Make it a full evening of entertainment with mini golf, SquareBurger, an old-school carousel, and tonight’s movie pick, The Lion King. Get cozy on a blanket or chair with the park’s picturesque fountain in the background. Fridays in July and August, catch recently released films in the shadow of City Hall. Grab a pitcher of your beverage of choice and snacks from the on-site cafe, and be sure to bring a chair or blanket. Every Wednesday through August, FringeArts presents an outdoor movie in their beer garden under the Ben Franklin Bridge. Grab a bite and drinks at La Peg (inside) or The Shack (outside). Wes Anderson’s runaway kids quirky dramedy Moonrise Kingdom is set for this week. Head to NoLibs for an al fresco movie night in the courtyard formerly known as the Piazza on Thursdays. There’s a train, there’s a murder -- it’s Murder On The Orient Express! Grab food from any of the nearby eateries beforehand, and be sure to bring your own chair. A large screen pops up along the Wharton Street entrance to the Schuylkill Banks Thursdays in July and August for a viewer-curated outdoor movie season. 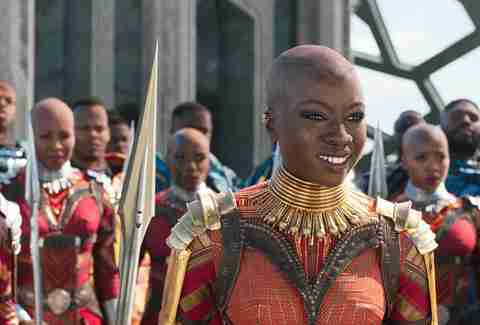 The banks will turn into Wakanda for a screening of Black Panther; you’re encouraged to bring your own picnic, but some snacks and beverages will be available. As a city wedged between two rivers, it’s only fair that the Delaware River waterfront get some movie action, too. Remember when Beyonce was in an Austin Powers movie? Now you will. Bring a blanket. As a part of the city’s Parks and Rec summer movie series, green spaces around the city will become makeshift movie theaters for family-friendly flicks. Are you sick of Coco yet? If not, come supplied with your own blanket or chair. As a part of the city’s Parks and Rec summer movie series, green spaces around the city will become makeshift movie theaters for family-friendly flicks. Come supplied with your own blanket or chair. Summer and fall First Fridays at the Betsy Ross House means old school horror and sci-fi movies, like the 1965 Invaders From Space, in the courtyard. Get a tour of the house first, then park yourself with your booze and snacks for the film. Fridays in July and August, catch recently released films in the shadow of City Hall. Grab a pitcher of your beverage of choice and snacks from the on-site cafe and be sure to bring a chair or blanket. If you couldn’t make yesterday’s screening of Black Panther, here’s another opportunity. Chestnut Hill hosts their own summer movie nights on a 28-foot screen Fridays in August, kicking off with the live-action version of Beauty And The Beast. Each week a different food truck will be on-hand to satiate your munchies; come supplied with your own blanket or chair. As a part of the city’s Parks and Rec summer movie series, green spaces around the city will become makeshift movie theaters for family-friendly flicks. It wouldn’t be summer movie season without a superhero movie, would it? Come supplied with your own blanket or chair. Every Wednesday through August, FringeArts presents an outdoor movie in their beer garden under the Ben Franklin Bridge. Grab a bite and drinks at La Peg (inside) or The Shack (outside), and see double the Lindsay Lohan in one of her finest roles. A large screen pops up along the Walnut Street entrance to the Schuylkill Banks Thursdays in July and August for a viewer-curated outdoor movie season. If you can’t make it to Northern Liberties to see Silver Linings Playbook, the Schuylkill River waterfront has you covered. You’re encouraged to bring your own picnic, but some snacks and beverages will be available. Fridays in July and August, catch recently released films in the shadow of City Hall. Grab a pitcher of your beverage of choice and snacks from the on-site cafe and be sure to bring a chair or blanket. Chestnut Hill hosts their own summer movie nights on a 28-foot screen Fridays in August, including The Princess Bride, which just celebrated its 30th anniversary. Each week, a different food truck will be on-hand to satiate your munchiess; come supplied with your own blanket or chair. The spacious and scenic Clark Park in West Philly turns into a movie theater for four weeks, beginning with this week’s Back To The Future. Pre-movie activities include a Polaroid photo booth (so come in your best ‘80s attire), period music, and food vendors. Come supplied with your own blanket or chair, too. Every Wednesday through August, FringeArts presents an outdoor movie in their beer garden under the Ben Franklin Bridge. Grab a bite and drinks at La Peg (inside) or The Shack (outside); rounding out the season is seminal camp flick Wet Hot American Summer. As a city wedged between two rivers, it’s only fair that the Delaware River waterfront get some movie action, too. Bring a blanket. Head to NoLibs for an al fresco movie night in the courtyard formerly known as the Piazza on Thursdays. Get musically transported to another city -- and era -- with Chicago. Grab food from any of the nearby eateries beforehand, and be sure to bring your own chair. Fridays in July and August, catch recently released films in the shadow of City Hall. Grab a pitcher of your beverage of choice and snacks from the on-site cafe and be sure to bring a chair or blanket. Just released late last year, The Greatest Showman was nominated for a Golden Globe. Chestnut Hill hosts their own summer movie nights on a 28-foot screen Fridays in August. Each week a different food truck will be on-hand to satiate your munchies. Come supplied with your own blanket or chair. The spacious and scenic Clark Park in West Philly turns into a movie theater for four weeks; pre-movie activities include a live music from the Mexican Cultural Center and food vendors. Come supplied with your own blanket or chair. Thursdays this summer, Manayunk welcomes food trucks, vendors, $6 dining deals, shopping and more for their Stroll The Street series. Tonight’s theme is Throwback Thursday, so revel in the ‘80s wonder that is Ferris Bueller’s Day Off. As a city wedged between two rivers, it’s only fair that the Delaware River waterfront get some movie action, too. You didn’t think you could go another few weeks without a Coco screening, did you? Bring a blanket. As a part of Mt. Airy’s Moonlight Movies, the neighborhood’s parks and the Trolley Car Diner host outdoor movie screenings on alternating Friday and Saturday nights through the end of August; the Dakota Fanning-voiced fantasy Coraline wraps up the summer series. Curated with kid-friendly selections in mind, the summer’s cinematic theme spotlights international cultures; there’ll also be food trucks, ice cream, and more. Fridays in July and August, catch recently released films in the shadow of City Hall. Grab a pitcher of your beverage of choice and snacks from the on-site cafe and be sure to bring a chair or blanket. 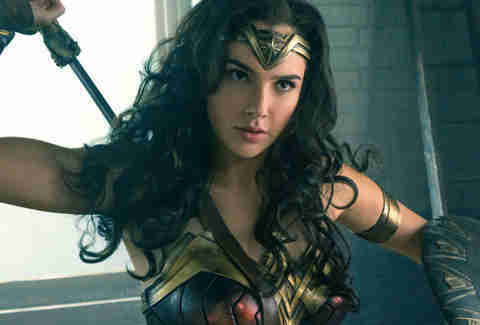 Close out the Dilworth season with Wonder Woman. Chestnut Hill hosts their own summer movie nights on a 28-foot screen Fridays in August. Head out for one more seasonal excursion to see The Greatest Showman. Each week a different food truck will be on-hand to satiate your munchies; come supplied with your own blanket or chair. Head to NoLibs for an al fresco movie night in the courtyard formerly known as the Piazza on Thursdays. 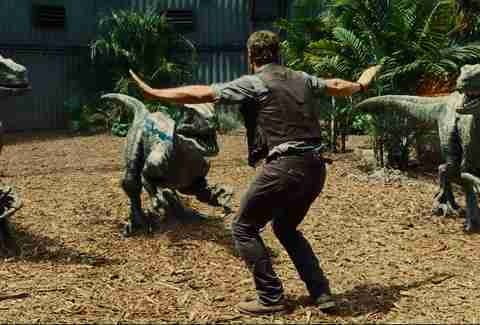 Chris Pratt & Co. return to save the galaxy in this summer event series-ending flick. Grab food from any of the nearby eateries beforehand, and be sure to bring your own chair. As a city wedged between two rivers, it’s only fair that the Delaware River waterfront get some movie action, too. 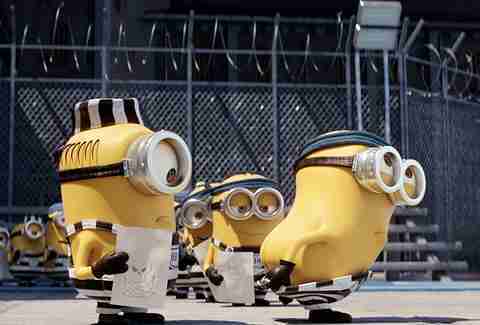 The season closes at this location with Despicable Me 3. Bring a blanket. Before these family-friendly screenings, get a tour of the historic garden, then cozy up in the garden courtyard for this once-monthly event. Peter Rabbit is the pick of the night. The spacious and scenic Clark Park in West Philly turns into a movie theater for four weeks wraps up with Black Panther. Pre-movie activities include a superhero costume parade, meet-and-greet with Amalgam Comics & Coffeehouse, a black-woman owned shop, and food vendors. Come supplied with your own blanket or chair. As a part of the city’s Parks and Rec summer movie series, green spaces around the city will become makeshift movie theaters for family-friendly flicks. Every neighborhood must have a Coco showing. Come supplied with your own blanket or chair. Summer and fall First Fridays at the Betsy Ross House means old school horror and sci-fi movies, like the 1955 Revenge Of The Creature, in the courtyard. Get a tour of the house first, then park yourself with your booze and snacks for the film. Before these family-friendly screenings, get a tour of the historic garden, then cozy up in the garden courtyard for this once-monthly event. Get wholesomely wild with The Good Dinosaur. A few times a season, this storied and picturesque cemetery hosts an outdoor screening on its grounds. Check out the OG vampire thriller Nosferatu with live musical accompaniment, and be sure to bring your own chair, blanket, and snacks.